http://1008anand108.webs.com/ tells more about global local voting with a view to a local question for Scandinavians, the Kingdom of Scandinavia was suggested as an environmental city by the aspiration of making Jæmtland independent, a part of Sweden, earlier part of Norway to, a Capital City of Scandinavia in Union with all of Scandinavia, where the other old independent countries invest land, money and business agreements with the new. 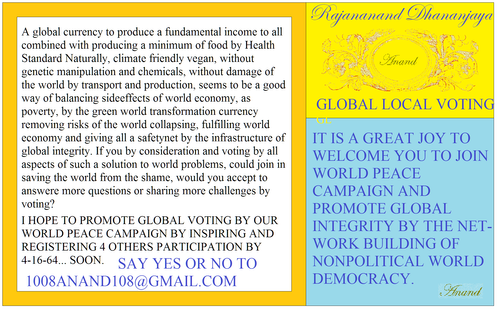 As an example of what Rajananand does for the whole world, he at least plan to be the King of the Ship and floating city Kingdom of Scandinavia, which we uses instead of capital city, as some probably illegal stupidity have made some one to protect Stockholm by the business idea of capital city of Scandinavia, probably stealing from our humanitarian foundation and also stupid because a capital city of one country can not be the city of other competing countries, Stockholm can not be so, unless by act of war. against Norway, Denmark and our "Vatican state city of a ship" as a start. Global local voting is important, network building of the universal campaign is most important, the city project itself is not at all important, please be free to say, no, and a yes means only yes to voting with the many questions of adaptation of the idea and project. we shall be grateful to hear from you and we seek persons to take responsibility for 1008 stock companies and 108 Ministries of the city government, 107, 1 found, as Chief Minister. Project coordinators by Friends of the World likewise. Global Voting to establish the blue currency as the global currency ensuring safe transport of money and registered what is on your bank account in any bank, as any transport of money is registered, may produce inexpensive transport of money and the security against the digital world not democratically controlled. A minimum new fundamental income for one and all to uphold weekly, as once a week , control of the system, seems important also to balance the shame of statistic of poverty as well as promoting the green world transformation by alternatives to organisations and products representing damage of the world as global warming imbalance. A long time ago in Trondheim perhaps almost to decades Anand met Dalai Lame just before he was giving an outdoor speech in Trondheim square, he received a copy of the book of 1986, a copy of the Norwegian constitution in English and a copy of the suggested Constitution of Jæmtland as independent country, or was that made after and sent him by mail, probably not. I think I mentioned the Union of Norway and Sweden with the Constitution of Norway as an example of possible union of Tibet with China. Very short meeting, not planned and he passed it to his secretary and met with the next person in the row of people there met up hoping to see him. I remember I asked if Lopsang Rampa was fiction or fact, and he said fiction, however in third eye, the book, written messages in Tibet was changed to stop them from being abused if lost, with these days internet, there is a tradition to consider, always only by personal meetings, present the true message. The constitution of Jæmtland was made as an example, as we did not want to disturb politics, our enterprise is non political, based on all's agreement. We have suggested the same for islands around China, Japan and Russia as well, for Israel, for Korea, later, but as an general opportunity of transforming problems to opportunities and peace. We plan to build at least 108 000 climate ships and at least 1008 new countries by those, and we welcome all countries to give away some land to global land and to invest some land for Countries of Global Integrity by World Peace Casmpaign, new countries with its own constitution integrating both the original constitution of Norway from 1814 without parties, World Constitution and articles of Union of the new countries with other nations, as that investing land. These articles may ensure territorial integrity for the country sharing land. After all a nation is a union of families sharing land, business, defence, health care etc. Land is important but not how much land, but how safe the land is, for the union of families. Investing a square km land or and a small island, even as small as the Vatican state in Rome, for territorial integrity s no bigger question than that of allowing embassies. New countries to promote our common world, health, climate and knowledge defence seems as a must these days in order to guard the most vital aspect of territorial integrity, the health of the environment. It may even be said to be proven gone, the territorial integrity of the countries in the world, the world practically have collapsed, at least so much be considered as the risk pattern, as all knowledge or facts are not established, but the 800 000 year proof of the thermostat or CO2 concentration known as greenhouse effect, and temperature going hand in hand indicates an increase in temperature of 10-12 degrees, while climate change measures is only 1, 1,5 for February this year though, and much higher local places around. This is 10 times higher than the calculation of the greenhouseeffect by the ckimate panel, and so is the amount of less water in the Gulfstream experts says in the period of 2004 to 2014, 10 times less water than the experts of the climate panel of UN says. This is the panel giving the international agreement by most countries in the world for what to do, or as an excuse for not doing what is urgent as one say the climate problem is 10 times bigger than the panel says, and not urgent at all, their problem does not probably exist, the world have already collapsed, action by the panels problem should have been taken 16 years ago or something. only one degree Celsius general plus for the whole world is registered, but scientist says all the time year after year that all the signs is accelerating, is a surprise coming faster than expected. This is probably because the temperature is 10 times more increased than the expected 1 degree Celsius. owing to the ocean is regulating temperature, about 75% of the earth is covered by water and ice, 71% of earth's surface is 3000 m deep ocean, it takes time to heat up the world, but by risk patterns here in this perspective phase transition or sudden changes may come any time, next week, next month, the situation needs immediate response from everyone, accepting a risk pattern where the world may collapse next week, is terrorism against humanity. It is like the atomic bombs of planes everywhere around the world is all ready in the air falling towards earth everywhere, the world is already gone, however there is a hope, that the bombs deactivation mechanism by radio, all the bombs may be stopped, in this analogy, where probably more damage to world society from climate collapse is to expect. So what must be done to stop the bomb, all must join our common world defence, now, and do what ought to be done, hopefully part time 2 hours a day, may do, and realization of the strategy of the defence is possible before the bomb hits the ground everywhere, before the infrastructure collapses, before the world as we know it is gone. Errors as corruption and incomplete action patterns to respond as scientists, business and governments in cooperation represents the pattern which created the problem, but also ignored it for 2 decades, that is upholding the problem, which simplified is ignoring our common world defence, citizens is partly responsible for the problem to, by the pattern of leaving responsibility to others, even though extreme problems by that is seen, as poverty. It is therefor good that the common world defence, have raised above the problem and have found a more universally acceptable foundation, not only fulfilling science but rising above it by Universitas Library of Integrated Growth, the concept better than science, innovation and sustainable development and other corrupted ideas. Founder of Universitas Enterprise and the defence is Rajananand Dhananjaya, before 2004 registered as Stein Roar Andersen. with 36-45 years of research and development of this knowledge. The bomb is already in the air, going more into the analogy comparing the collapse of the environment by climate change with a bomb hitting the world everywhere, it is important to know that the climate change can be worse than the bomb hitting your community where you are and that the collapse already probably have happened, the bomb is in the air, on its way hitting you and your surroundings , an attach on the whole world would probably be some hundred rockets, sent towards strategic and tactically choice targets in order to destroy the whole world. the rocket is in the air, is is just a short time before places around the world are hit, and the destruction of the world total. Is there time to stop these rockets by radio communication with them, what would it take. That is the question of todays climate change situation, is it at all possible to stop the process before it manifests in total destruction of our world and do we have enough time, are we sane and healthy enough to respond, in time represents the other side of the desperate situation. If at all possible from these 2 points of view both, the one and only common world defence there is, is founded by Rajananand and have all it takes for people to join in doing what ought to be done, at least 2 hours a day perhaps much more for the Marshall Law period , now when the "bomb" is in the air. THE BOMB IS IN THE AIR, PASS THE MESSAGE AND DO NOT JOIN THE OPPOSITION, THOSE NOT INTO OUR ONLY COMMON DEFENSE, THOSE ARE MORE OR LESS BY THE REASON WHY WE HAVE THE PROBLENM IN THE FIRST PLAE.